The aRIFT+ Warrior Project helps teen and YA girls who've experienced assault move beyond their attack to live in total freedom. 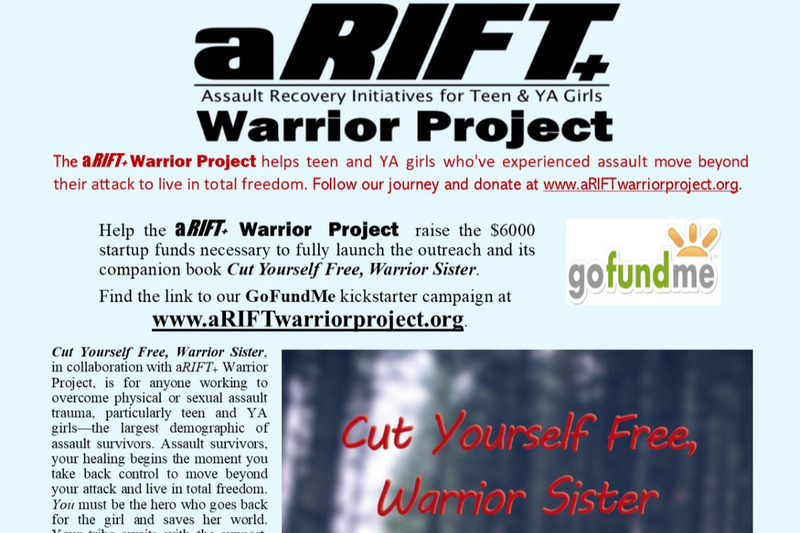 In the next 60 days, help the aRIFT+ Warrior Project raise the $6000 startup funds necessary to fully launch the outreach and its companion book Cut Yourself Free, Warrior Sister. Our aim is to lead teen and YA assault survivors to their tribe and align them with the support, knowledge, and strategies they need to navigate the valley of recovery. We are building an organization and supporting literature that share experiences and insights, breakdowns of the assault grief stages, expert findings and data on physical and sexual assault, recovery resources and support, and an integration of recovery initiatives and challenge options—all designed to help young survivors move forward from the incident that fractured them so total healing can promote self-restoration. Follow our journey and find the link to our GoFundMe kickstarter campaign at www.aRIFTwarriorproject.org. All proceeds go toward startup costs and launch of the outreach and book.